Credits: ESA/Rosetta/MPS for OSIRIS Team MPS/UPD/LAM/IAA/SSO/INTA/UPM/DASP/IDA and Dr Paolo C. Fienga/LXTT/IPF for the additional process. and color. This second Annotated Image depicts other 2 (two) out of the 5 (five) potential Landing Sites selected for the Rosetta Mission's "Philae Lander". The aforementioned Landing Sites (here named "B" and I") are located on the smaller one of the two Lobes that make up the Comet 67P/Churyumov-Gerasimenko. Five candidate Landing Sites were identified on Comet 67P/Churyumov-Gerasimenko during the Landing Site Selection Group meeting that was held in the month of August (23 and 24), 2014. The approximate locations of the five regions are marked on three OSIRIS Narrow-Angle Camera Images taken on August 16, 2014, at a distance of about 62 miles (such as approx. 99,779 Km) from the Comet (remember that the Comet's Nucleus is approximately 2,5 miles - such as about 4,023 Km - across). Each Elliptical Landing Site covers about 4/10th (four-tenths) of a square mile. To each of the possible 5 Landing Sites was assigned a letter from an original pre-selection of 10 possible Landing Sites, originally identified from "A" through "J". Please, notice that the lettering scheme does not signify nor imply any ranking. 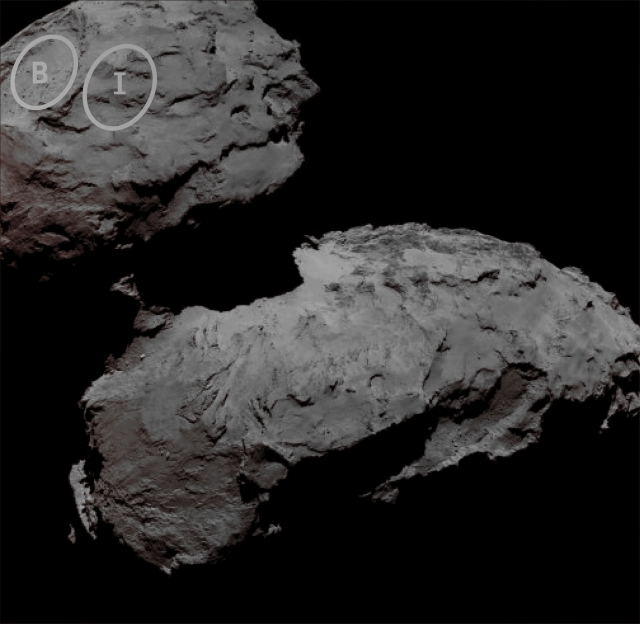 Along with the two Landing Sites which are located on the smaller Lobe that forms the Comet's Nucleus, two more Landing Sites (once again, unseen in this image) were found on the larger one. Choosing the right Landing Site, as you can easily understand, is a VERY complex and difficult process. In fact, the chosen Landing Site shall have to balance the technical needs of both the Orbiter and Lander during all phases of the Separation, Descent, and Landing, as well as during the operations that will be carried out on the Surface of the Comet with the requirements characterizing the 10 Scientific Instruments placed onboard the Philae Lander. This frame (which is a crop taken from an Original ESA - Rosetta Spacecraft's b/w and NON Map-Projected image published on the NASA - Planetary Photojournal with the ID n. PIA 18777) has been additionally processed, contrast enhanced, magnified to aid the visibility of the details, Gamma corrected and then colorized - according to an educated guess (or, if you wish, an informed speculation) carried out by Dr Paolo C. Fienga - in Absolute Natural Colors (such as the colors that a human eye would actually perceive if someone were onboard the ESA - Rosetta Spacecraft and then looked outside, towards the Comet 67P/Churyumov-Gerasimenko) by using an original technique created - and, in time, dramatically improved - by the Lunar Explorer Italia Team. Different colors, as well as different shades of the same color, mean, among other things, the existence of different Elements (Minerals) present on the Surface of the Comet 67P/Churyumov-Gerasimenko, each having a different Albedo (---> Reflectivity) and Chemical Composition. Note: it is possible (but we, as IPF, have no way to be one-hundred-percent sure of such a circumstance), that the actual luminosity of the Comet 67P/Churyumov-Gerasimenko - as it is in this frame - would appear, to an average human eye, a little bit lower than it has been shown (or, better yet: interpreted) here.